It was one of a vast number of the star’s personal items, from screen publicity shots to clothing and a 1954 Christmas card to her from pianist Liberace, that sold at the Icons and Idols of Hollywood auction over the recent Friday and Saturday of November 16 and 17. The Ford Thunderbird is believed to have been given to Monroe by her business partner and photographer, Milton Greene whose wife Amy often talked about the times she and the actress would go riding in the car. Marilyn Monroe owned the Thunderbird for six years, before giving it as an 18th birthday present to the son of her acting tutor, Lee Strasberg a few months before she died of a self-administered barbiturates overdose in 1962. 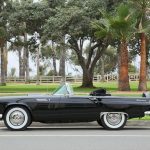 Thunderbirds were extraordinarily popular in the United States from when the first hit the road in 1954, with some 15,631 of the Marilyn Monroe 1956 model selling in that year alone, and production not ceasing until a near-50 years later in 2005. And would anyone at Ford in 1956 have ever thought that that car would fetch the near-half-million it sold for on November 17 of this year – considering that when it rolled brand-new out of the showroom, it had cost its first owner all of US$2,944? 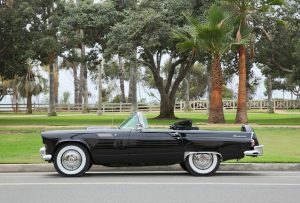 MARILYN MONROE’S sleek Ford Thunderbird convertible that’s just gone under the hammer at Julien’s Auctions’ Icons and Idols of Hollywood sale for US$490,000 (AU$668,000) – somewhat grown on the $2,944 it cost its first owner to drive out of the showroom in 1956.